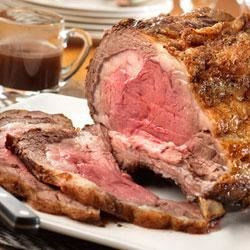 A standing rib roast WOW!!! That what you will get is a very special treat and traditional Feast Days..
Heat the oven to 325 degrees F. Season the beef with the black pepper. Place the beef into a roasting pan, rib-side down. Spoon off any fat from the pan drippings. Stir the wine in the pan and heat over medium-high heat to a boil, stirring to scrape up any browned bits from the bottom of the pan. Reduce the heat to medium and cook for 5 minutes. Pour the wine mixture through a fine mesh sieve into a 2-quart saucepan. Stir the stock and flour in a medium bowl with a whisk. Gradually add the stock mixture to the saucepan, stirring with a whisk. Cook and stir over medium heat for 5 minutes or until the mixture boils and thickens. Season with additional salt and black pepper, if desired. Serve the stock mixture with the beef.